No matter your commercial or residential low pressure power washing needs in Fuquay Varina NC, Peak Pressure Washing has solutions. The outside of your home or business will provide the first impression people will make, so ensuring that the exterior is free of dirt and clean is essential. Our low pressure power washing services for your home or business exterior begins with a chemical application powerful enough to remove even the toughest dirt, mold, and grime, but the eco-friendly solution will not damage siding, wood, stucco, or other materials. We then rinse your exterior with low pressure to remove even the toughest grime and staining without damage. No matter your commercial or residential low pressure power washing needs, contact Peak Pressure Washing in Fuquay-Varina NC. Exposure to the elements can stain the roof of your Fuquay Varina, NC home or business. Dead leaves, pollen, mold, algae, fungi, & other similar substances can mar the appearance of your roof. 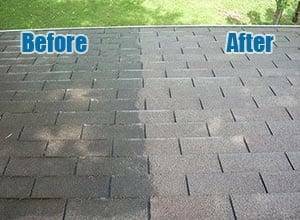 Commercial & residential low pressure roof washing, cleaning, & stain removal in Fuquay-Varina, NC from Peak Power Washing can renew the appearance of your roof without damaging shingles, tiles, or the roof itself. 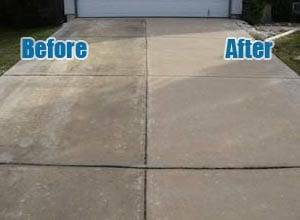 Parking areas, driveways, walkways, and other concrete & masonry areas of your home or business in Fuquay Varina NC can be stained by grease, oil, rust, weathering, and other substances. Peak Pressure Washing has the concrete power washing services you can trust to restore the original beauty of these areas. We have the tools and experience to get your driveway, walkway, parking lot, patio, or other concrete area in Fuquay Varina looking great fast. Is the signage or awning at your gas or service station or other business in Fuquay-Varina, NC looking dull and dirty? Do you manage a condominium or apartment complex, HOA, or own a home that needs deck cleaning? Look no further than Peak Pressure Washing. Our commercial low pressure signage & awning washing and residential soft wash deck cleaning services in Fuquay Varina, NC are top of the line. Gutters can be clogged as a result of debris like dirt, pollen, and leaves. 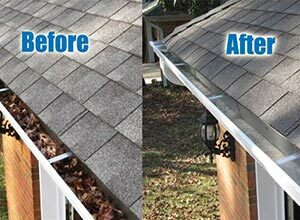 Even gutters with guards become discolored from stains and weathering. 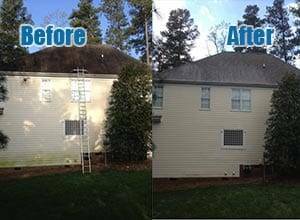 Peak Pressure Washing proudly offers commercial & residential pressure wash gutter cleaning & gutter face washing in Fuquay Varina, NC. Our pressure wash & gutter face wash services will have your gutters sparkling without fear of damage in no time. Peak Pressure Washing is your source for commercial & residential low pressure power washing services. 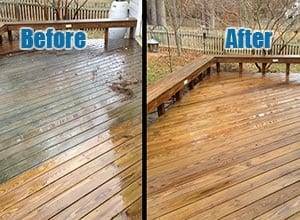 We proudly offer our pressure washing & power washing services in Fuquay Varina, Cary, Apex, Raleigh, Holly Springs, Clayton, Durham, Garner, Morrisville, Knightdale, & beyond.